USA Today reports that six of the top ten cities with the most polluted air in America are all located in just one state. Take a guess as to which. It is not mere coincidence that America’s most populous state – California – also has the most polluted air in the country. Whether or not they even drive or own a car, SUV or pickup truck, all of our nearly 40 million residents contribute directly and indirectly to air pollution. Perhaps the only surprise, although not to air quality experts, is that neither Los Angeles nor San Francisco is No. 1 in the American Lung Association list. Rather, the top four cities – Bakersfield, Visalia, Fresno and Modesto – are all found in California’s rapidly growing Central Valley. In the San Joaquin and Central Valleys, increased vehicular emissions from population and traffic growth and “fugitive dust” from extensive farming operations are trapped by surrounding mountain ranges (Coast Range on the west, Sierra Nevada on the east, Tehachapi Mountains to the south) to create dangerously high levels of suspended particulate matter. 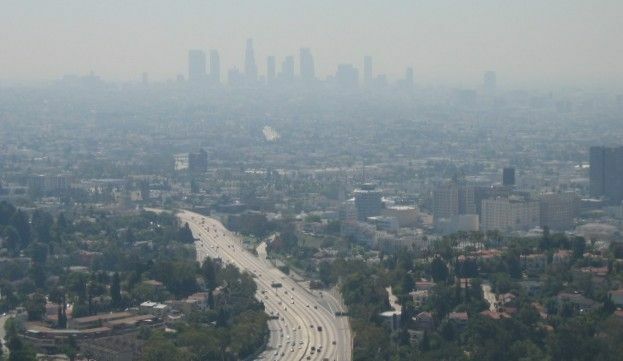 L.A.’s sickly air: if you can see it, breathing it is harmful to your health. Not to be left behind, the Los Angeles/Long Beach area – the legendary “birthplace of smog” – does once again hold the disreputable title, as it has so often before, of having the nation’s worst ozone pollution. Ozone (O3) is an invisible but harmful gas that is formed when volatile organic compounds (VOCs) react chemically with nitrogen oxides (NOx) in the presence of sunshine. High in the stratosphere, ozone is crucial in blocking harmful ultraviolet B (UV-B) radiation from penetrating our atmosphere and reaching the ground, but so-called tropospheric or ground-level ozone is extremely harmful to human health, crops and ecosystems. California also has seven of the worst ten cities afflicted with ozone pollution nationwide, including (after Los Angeles/Long Beach), Bakersfield, Fresno-Madera, Visalia-Portersville-Hanford, Modesto-Merced, San Diego-Carlsbad and Sacramento-Roseville. But it is at the county level of air pollution measurement that California’s status as the state with the nation’s worst air quality is most evident. the worst particulate air pollution in the country. For year-round fine particulate matter pollution, nine of the ten worst counties in the U.S. are in California: Kings, Kern, Tulare, Fresno, Madera, Plumas, San Joaquin, Riverside and Stanislaus are ranked 1 through 9 nationally. All but two of these (Riverside and Plumas) are in the Central Valley. East of L.A., Riverside catches much of its smog from prevailing onshore winds, which push the smog layer up against the blocking San Gabriel Mountains and Transverse Ranges. Plumas County is in the Sierra Nevada, just east of the Central Valley. Eight of the ten counties in the country most afflicted with ozone pollution are Californian: San Bernardino, Riverside, Los Angeles, Kern, Fresno, Tulare, Madera and Kings are ranked one through eight. even as other factors that tend to raise emissions have increased. 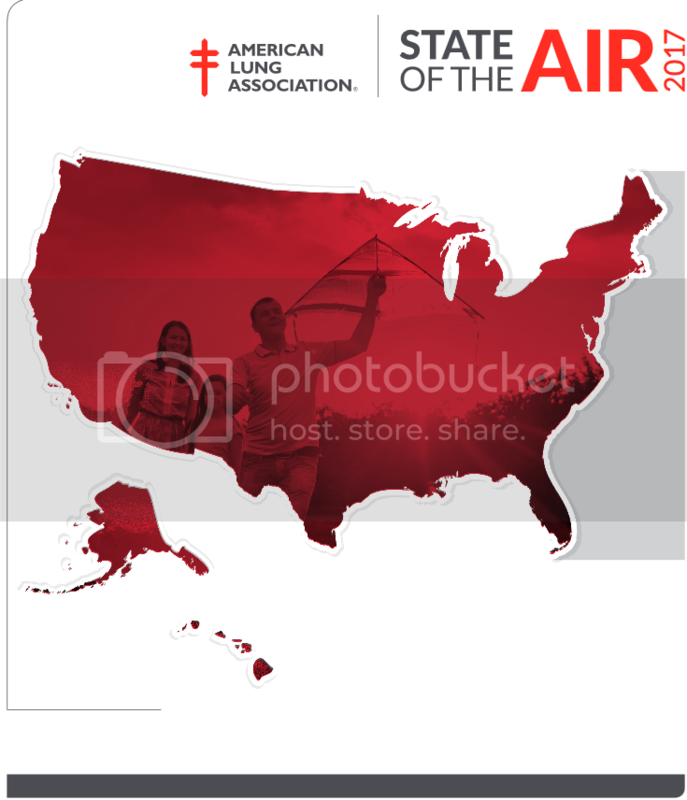 American Lung Association, State of the Air 2016. The American Lung Association report emphasizes that, overall, there has been remarkable progress in cleaning up the nation’s air since 1970, when the Clean Air Act was passed. 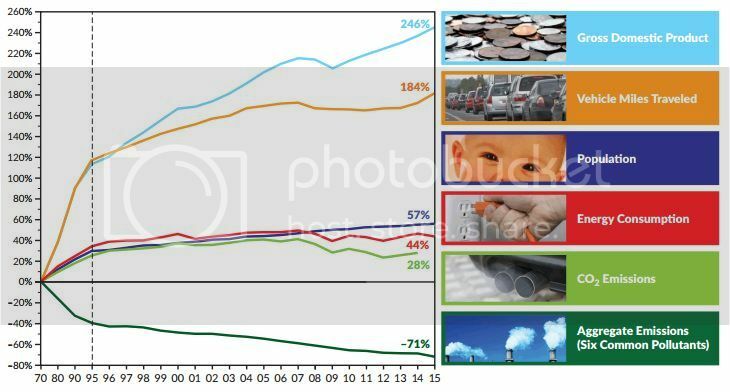 Indeed, aggregate emissions of six common air pollutants from all sources (vehicles, power plants, factories, etc.) have declined by 71 percent since 1970, despite growth in the economy, population, vehicle miles traveled and energy consumption, all of which would tend to push emissions upward. This is due to law and regulation-enforced implementation of “techno-fixes,” that is, technologies such as catalytic converters, exhaust gas recirculation, electrostatic precipitators, baghouses and so forth, which scrub air pollutants like VOCs, NOx and particulates from waste flow streams before they are released to the air through tailpipes and smokestacks. But there remain a number of air quality problem areas, and many of them are in California. Our state’s enormous existing population of almost 40 million and expected additional growth in the coming decades of many millions more – almost all of it from discretionary federal immigration policies – won’t make cleaning up California’s persistently crappy air any easier. This is one reason, among many related to health, quality of life and environmental sustainability, that CAPS supports better enforcement of immigration laws already on the books and lower immigration levels overall.